Zero Tolerance has had some interesting releases in 2015. What especially intrigued me was their addition of a few smaller folders to the line up. The 0450, 0900 and 0808 all feature 3.25″ and smaller blades and come in under 5 ounces. This may not seem like much of an accomplishment, but considering the brand’s origins – monster folders like the 0300 and 0560 – these new offerings are much smaller and more pocket friendly. Of course there is still plenty room for monster truck knives in their roster. Designs like the 0999 assure us that ZT has no intentions of cutting short the freak show any time soon. But at least part their line up is trending towards smaller, more practical daily carry blades. The 0808 was designed by renown custom knife maker Todd Rexford. Todd also designed the 0801, which was a successful knife, but seemed a little plain. The 0808 strikes me as a much bolder design. When originally commenting on the knife on an episode of Gear Geeks Live, I said that it reminds me more of a surgical instrument than a pocket knife. I still feel that way. The spare design, shiny hardware, and monochromatic color scheme all lend a futuristic feel to the knife. It was one of ZTs more intriguing offerings for the year, and with 2016 fast approaching I felt like it was high time to examine the 808. The 0808 has an overall length of 7.625″, a 3.25″ blade, weighs 4.3 ounces, and is made in the USA. It is a good deal smaller than the 0801 and is noticeably lighter. Personally, I like that, and the knife is bound to appeal more to the urban Every Day Carry (EDC) crowd then some of ZT’s older offerings. Still, the knife has some heft to it, thanks to full titanium construction. This isn’t a gent’s folder or ultralight EDC. The blade of the 0808 is what I would describe as a modified clip point, although I think you could also argue that it is a modified wharncliffe. Regardless, it’s an atypical and angular blade shape that seems more at home on the set of Aliens than it does in my pocket. It has a very fine tip and a high flat grind. There is a non-functional swedge that adds to the visual appeal of the knife and follows the line of the handle. The grinds are all “belt finished” satin while the flats are lightly stone washed. Zero Tolerance selected S35VN for the blade, a USA made steel forged by Crucible. I have taken a shine to S35VN over the past couple years. I like it more than its predecessor, S30V, largely because I have found it easier to sharpen. S35VN displays all of the other characteristics I am looking for in a higher end steel, including decent edge retention and corrosion resistance. The 0808 cuts well. The stock is thick for a smaller knife, but the flat grind gets thin behind the edge and the needle fine tip is excellent for detail work. I had no problem breaking down boxes, although the absence of belly made it less ideal for food prep. I have had no issues with rust or corrosion. The edge is easy to maintain and so far all I have needed to do to strop the knife and occasionally run it on the fine stones of my Spyderco Sharpmaker. The handle of the 0808 features titanium handle slabs, and a chunky polished titanium backspacer. Everything is held together with stainless steel hardware. I like the clean look of the 808 and the details are (mostly) subtle. The faceted handle and high polished pivot and backspacer lend to the knife’s futuristic look. I could do without the engraved “Zero Tolerance” logo on the show side, but it isn’t too bad and I suppose they have to place their logo somewhere. The handle slabs have been stonewashed, which helps hide wear. The fit and finish is excellent. The ergonomics of the knife are simple and comfortable. I am able to get a full grip without any issue. There are no finger choils and there is no jimping except for 5 grooves on the flipper tab. Some may bemoan the apparent lack of traction. Admittedly, I have not used this knife to skin a deer or engage in hand to hand combat, but I had no issues with the knife slipping out of control under normal use. I didn’t notice anything in the way of hot spots either. But if you are looking for a serious “traction plan” then you will need to either bust out the skateboard tape or mosey on to stickier pastures. I do want to mention that the titanium backspacer is substantial, and the knife does feel slightly off balance. This isn’t a chopper or a fighting knife, and it was not a big deal for me, but it is worth noting. The pocket clip of the 0808 is not my favorite aspect of the knife. It shares some interesting similarities to the Hinderer XM-18’s clip, but leaves a lot of the knife exposed when it is in your pocket. That said, the handle looks like it will accept ZT’s deep carry flip found on knives like the original 0560. I am not necessarily a deep carry clip snob, but I don’t like having a 3/4″ of a knife poking out of my pocket either. Retention is OK, but because this is a smooth titanium handle, and because we have a relatively heavy knife, I also have some concerns about the 0808 falling out of the pocket when the clip is used with lighter fabrics. While the clip isn’t a death knell for the review, it is my biggest gripe with the knife. For my money, Zero Tolerance makes some of the best flippers. This 0808 is no exception. The knife comes with a caged bearing system and a dialed in detent. The blade flies open without fail every time, and is extremely secure in the closed position. My bearings are incredibly smooth and the blade falls shut upon disengagement. It is worth noting, that in the past ZT has used a blue nylon cage for their bearings. This time there is a metal cage – perhaps to accommodate the smaller footprint of the 808. The 808 is a titanium framelock with a stainless steel lockbar insert. ZT makes a lot of titanium framelocks with steel lockbar inserts, and lockup is on my knife is early and secure. No blade play and no stick. This is how a framelock should be. My blade is not perfectly centered, but it is close. Once again Zero Tolerance has managed to deliver the goods. This is a design from one of the hottest knifemakers in the industry right now, and Todd’s design has been executed brilliantly with top notch materials and superior fit and finish. The knife is also priced reasonably when you consider that you are getting a USA made folder with premium materials and all the bells and whistles. I like that Zero Tolerance decided to embrace smaller knives in 2015. Yet the 0808 isn’t short on quality or detail, and this is probably my favorite knife from ZT for 2015. The pocket clip is my biggest gripe, and that can be fixed with an aftermarket clip (I have seen some on Ebay for around $30, as time goes on the prices on these will likely drop). Besides that, I find little to complain about when it comes to the 808. I will be curious to see if Zero Tolerance continues in the direction of these smaller blades. All in all, if you are at all interested in the 0808 I can safely recommend it. At the time of writing this review Amazon is selling these for around $150. 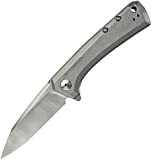 At that price the 0808 is unbeatable if you are looking for a titanium framelock flipper. Not sure if that is a pricing error or what, but it’s a heck of a deal. I recommend purchasing the 0808 at Amazon or BladeHQ. Please consider that buying anything through any of the links on this website helps support BladeReviews.com, and keeps the site going. As always, any and all support is greatly appreciated. Thank you very much. ZT 0808 is very well executed. Love the blade shape and low-profile flipper tab. Feels good in the hand being wider at the bottom of the handle. A little jimping on the spine would’ve helped. Put the clip of the ZT 0560 on mine and it’s much better now. A tad too bottom heavy. Thanks, Ramin. Some valid points there. I agree, this knife is a bit bottom heavy with that chunky backspacer. Good observation! I REALLY like the aesthetics of the 0808 and have wanted one all year. I hate the way that clip looks with the old logo, but I didn’t even notice the placement until your review. That does look way too low for a knife like this. ZT REALLY needs to get rid of that old logo. I understand it’s a branding thing and it’s hard to switch, but they need to just rip off the band-aid and be done with it. It’s horrible. This one looks really interesting. How well does it slice? After cutting my finger open I’ve found that chunky cutters don’t have as much appeal to me, so slicing potential is a must. It actually is a good slicer. They did a good job thinning it out behind the edge. Very capable knife. Great Knife all the way round!!! I agree, Ralph! ZT did a nice job with this one. Hi Dan, how does this compare between the Caly 3 and the zt 0450? Been wanting to get either 1 of the 3 for my first “premium ” quality knife being with like titanium or carbon fiber. Big fan of the companies. I then to prefer more towards flippers but the spyderhole being just as much enjoyable. Any opinions? Im also quite concerned about the size and discreet carry. The Caly 3 will be the slimmest and most discrete between all 3 (although admittedly I have not handled a 0450). Because the Caly 3 is being discontinued, it would probably be at the top of my list, then the 0450 (smaller and easier to carry than the 808), then the 808. The 808 is a sweet knife, and smaller than a lot of ZTs, but it’s still got some heft to it. Just my .02. Hope this helps – good luck!